Today's the day we reveal the accessories created with the inspiration of a Design Seeds palette assigned to each of us. Erin of Treasures Found is hosting this Challenge of Color. Participants were asked to pick a color family for their palette from 12 options. We could choose a favorite or even something that would be more challenging. I almost predictably chose blue. However, I opted for blue not just because it's my favorite, but also because I knew I have an array of blue beads no matter what shade I was assigned. Here's the beautiful palette from Design Seeds that Erin picked for me. I was immediately thrilled with these colors because of their brightness. However, as I began to try to match the tones to beads in my stash and shop for beads elsewhere, I found that they were harder to find than I expected. 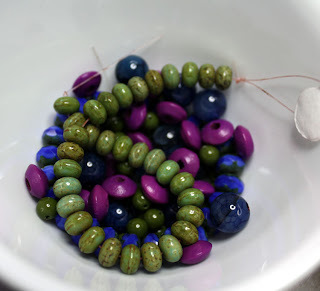 As I revealed in my Bead Table Wednesday post from last week, I did pull together some beads from my own stash that I thought would be perfect for the challenge. As you can see in the picture above, I was lacking the deep gray and pink from the palette. I really wanted to include each of the palette colors and played around with alternative ideas of how to bring in those shades. Ideas included: buttons, painting beads or buttons, polymer clay, fabric, and painting metal with nail polish. However, none of those ideas really worked for me. I did find some paint in the right shade of pink and decided that an antiqued steel would work well for the gray. 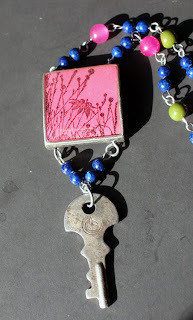 So, I painted some paper pink, stamped it, and sealed it in resin in a steel bezel. As well, I used some of the scrap painted paper to create a few paper beads. I laid everything out and played around with the materials. As great as these are, I still was not inspired enough to create a necklace. No matter how I combined that great array of beads they just weren't speaking to me. The purple was too dark, the bright blue was too bright, the dark blue were too heavy, the paper beads were too juvenile. GAH! With just two days left before the reveal, I pulled the pendant and the key aside because I knew those were the two I wanted the most in the piece. 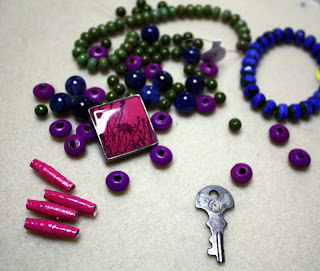 I then envisioned the necklace around those two pieces and simply pulled out some other beads. So, after ALL THAT, here's what I created. Let me say that the beads I used for the purple shade turned out to be a bit more pink than I expected in the pictures. Anyway, despite the struggle, I'm really happy with the piece. Please go check out how each of the other participants handled their Challenge of Color palettes. Here's the list! I can't wait to see how everyone else handled this Challenge. A big thank you to Erin for organizing this Challenge and to Jessica Colaluca for use of her Design Seeds palettes as inspiration! What a good idea to incorporate the key as the gray colour. Love the focal you put together ( one day I want to learn how to do that!) and the blue beads are perfect choice. I think this is so lovely. I think the colours work so well together! The struggle was definitely worth it! I am loving all the colors in this challenge! You piece is so fun! The key is perfect! Very cool - love it - it will be very fun to wear! All the components are just lovely. 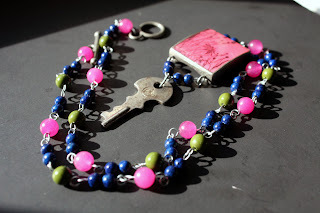 How fun to add the key, but my favorite part is the pink focal. I love the focal you created and how you pulled it all together. Very cool and very pretty! JKD- Thanks so very much!! That key seems to be popular. I'm so glad I had the stroke of inspiration to add it! It's so colorful and cheery! Great work! I love the pendant and the key combo! Your colors just pop! I love your focal. I know just how you felt ;) You wound up conquering it in the end though. That bezel/key work very well together and I think you were right to work around that like you did. Yay! love how the colors stands out in your piece! yay for the challenge! Well, all your struggles were certainly worth it! That necklace is wonderful. I love, love, love that pendant! Hope, I know what a struggle it can be to get your creative juices flowing full force, but the flow came and look at the beautiful results. You had a wonderful color palet to work with and you did it justice your necklace is very pretty. Oh what a fun piece! You did a beautiful job! Stephani- Thanks! I had a lot of fun and even learned despite the struggle to get this piece made. Thank you for stopping by! Miss Hope! You know I am smitten with the key, and what a perfect way to bring in that steely gray color in the palette! That pendant you created is fabulous. Again, very inventive use of materials. I like what you did very much and especially that you showed how the process sometimes gives you hiccups. But you kept on going and look at what you created! Thank you for playing along with me in the challenge of color! Your palette is so pretty, but a challenging one too. Your necklace turned out great. Sometimes pieces just flow together and other times its a struggle. I think its so cool that you decided to create components in the colors you were missing from your stash. I LOVE the pendant! A lovely dish of color. I love your designs. Despite your struggle - this necklace is GORGEOUS! 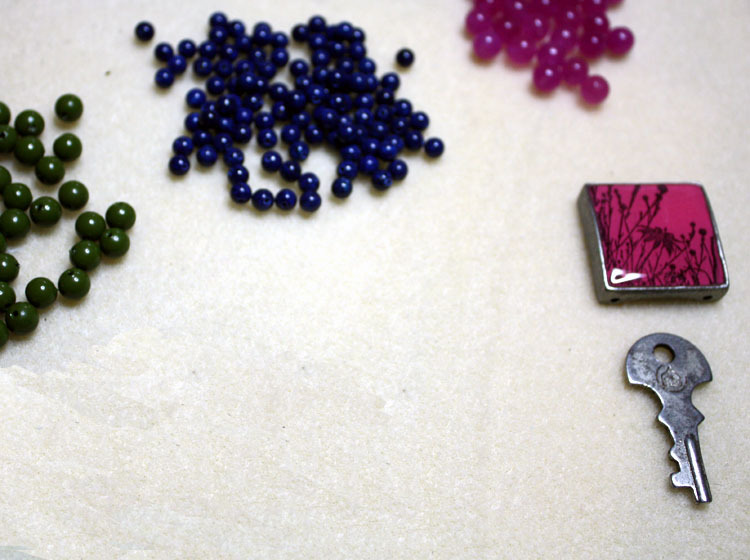 I love the resin pendant you created and you really pulled the other colors in perfectly! What a lovely but challenging palette you had to work with - it would definitely have stumped me! I absolutely love the focal you created, and the design of the necklace around it is beautiful. Great job, Miss Hope! I enjoyed reading about your design struggles and I knew how you felt every step of the way, Great idea about painting the paper and using it in a bezel to create a focal. I will have to remember that. And you ended up with a lovely piece. What a pretty palette! The resin pendant is so beautiful! I think you did a great job. I love that focal you made and the colors in your palette. Very nice. I love the key and your pendent is awesome. I think you really had fun with this challenge. Isn't it funny how we start out with an idea and end up with something completely different! Your end result is really fun. I also love the pendant that you created and how you placed it in the design. Well done! wow - the colors you have are so cool! I love your design, too!! BEautiful! What a gorgeous palette! I think you definitely did it justice :) Well done! I love the pendant best lol, just so pretty! Hope!! the necklace you created is STUNNING!! The pendant and pops of color are fabulous!! Love!!! Great job!! 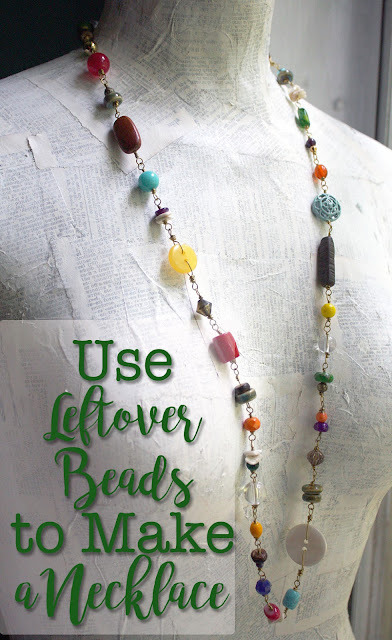 What gorgeous colors, you did a great job with your beads and created a lovely necklace. Beautiful! Mary- I really did try to convey what was going through my mind as I fought to conquer this challenge. I kept going back and forth with the paint. . . I really couldn't decide whether to just paint some beads or poly clay. When I found the bezel, that focal just fell into place. It was really easy after that! Thanks so much for stopping by! You created a wonderful focal and using the key was such a nice idea. You made a great use of your palette! This is so much fun, glad it all came together for you in the end! If I was allowed to name it I think I would call it something like 'unlocking your childhood' because of the key and the fact that it just seems to invite fun and a smile. (I hope that isn't too cheeky!) Love it. I love the key hanging from the pendant! Such a great idea! Those colors are so cool! Love what you did with it! What a lovely pendant/component you made! The necklace is so bright and beautiful -- and I really like the way you suspended the stamped pendant and key. Fab job! Love the focal and the necklace is lovely! Hey Hope, great job and I love your pendant!